Alex Hughes was born in Savannah, GA and moved to the south Atlanta area when she was eight years old. Shortly thereafter, her grandfather handed her a copy of Anne McCaffreys Dragonrider series, and a lifelong obsession with scifi was born.Alex is a graduate of the prestigious Odyssey Writing Workshop, a Semi-Finalist in the 2011 Amazon Breakthrough Novel Awards, and a member of the Science Fiction Writers of America and the International Thriller Writers. 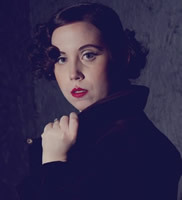 Her short pieces are published in several markets including EveryDay Fiction and White Cat Magazine. Mindspace Investigations — (2012-2014) A RUTHLESS KILLER — OUT OF SIGHT, OUT OF MIND. I used to work for the Telepath’s Guild before they kicked me out for a drug habit that wasn’t entirely my fault. Now I work for the cops, helping Homicide Detective Isabella Cherabino put killers behind bars. My ability to get inside the twisted minds of suspects makes me the best interrogator in the department. But the normals keep me on a short leash. When the Tech Wars ripped the world apart, the Guild stepped up to save it. But they had to get scary to do it — real scary. Now the cops don’t trust the telepaths, the Guild doesn’t trust me, a serial killer is stalking the city — and I’m aching for a fix. But I need to solve this case. Fast. I’ve just had a vision of the future: I’m the next to die. Clean is the first installment in the MINDSPACE INVESTIGATIONS series by Alex Hughes. It’s sort of a mix of police procedural, mystery, urban fantasy and science fiction. Set sometime in a distance future, humans have become wary of artificial intelligence and the telepathic abilities of the people who saved humanity from the sentient computers during an event now known as the Tech Wars. Some people still have internet interfaces implanted in their brains, but most of their fellow humans regard them with disdain and are ready to revert to pre-internet forms of technology. 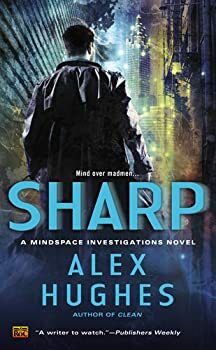 Sharp is the second full novel in the MINDSPACE INVESTIGATION series and is a direct follow up to the first book Clean. Adam is still struggling from the after-effects of his over-extension of his abilities at the end of Clean and is having a hard time keeping up with the pace of his work while coping with the never-ending craving of addiction. A new case comes up, a vicious murder, and Adam is tasked to determine if there is some psychic evidence that he can add to the investigation. When Adam and Detective Cherabino get to the scene of the crime, Adam is stunned to find that the victim is Emily, one of his former students. Adam had destroyed Emily’s psychic abilities through negligence while he was in the throes of his addiction and still an instructor for the Guild. For a couple more days you can still enter to win a copy of Clean or Sharp, the first two MINDSPACE INVESTIGATION novels. My friendship with Adam has covered three novels now. Alex Hughes has taken me into a different future of the world I live in and made it very real for me, but the best part is that I’ve befriended a hero who I completely understand and admire. That’s right, I admire Adam the drug addict. 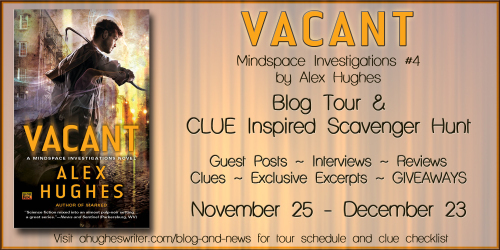 Vacant is the fourth book in Alex Hughes’ MINDSPACE INVESTIGATIONS. I absolutely loved the first three books, Clean, Sharp, and Marked (read my reviews) and this has been my favorite series for the past couple of years. Marked was my favorite book of 2013. However, I didn’t like Vacant as well and I hope (and expect) that this is just a minor setback in the series. The most compelling element of the MINDSPACE INVESTIGATIONS series for me is all about the main character, Adam, and his fight with addiction. It is visceral and written so well that I can almost feel Adam’s pain as he craves something he knows will destroy him. Today we welcome debut author Alex Hughes, who has a question for you. Her novel Clean will be released next week. One commenter will win a copy of Clean. I’m Alex Hughes, debut author of the book Clean. I’m also a huge foodie. There’s nothing that makes me happier than sitting down with a gourmet meal — in a restaurant, of course, but especially in my own kitchen. There’s something therapeutic about cooking, about playing with a new recipe and making something delicious. 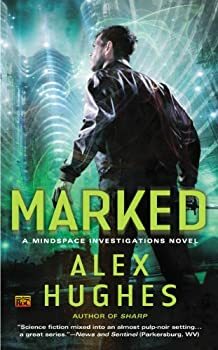 Today we welcome Alex Hughes, author of the MINDSPACE INVESTIGATIONS series. The second novel, Sharp, was one of my favorite reads last year. I've just finished the excellent third volume, Marked, which will be released on April 1. In Marked, Adam is investigating a case at the Telepath's Guild. Adam continues to be one of my favorite urban fantasy heroes because his struggles feel so viscerally real. The emotional agony and practical physical pain he combats as he struggles to maintain his sobriety in the face of difficult life transitions are poetically beautiful. 1. We're giving away an ebook copy of any of the novels -- your choice. Just comment below to enter the giveaway.